Often times, when we are creating portraits, we take an observant role and let the scene unfold naturally. When we met these two brothers, we knew we were in for a fun time. Big brother has a great sense of humor and little brother was happy to be along for the ride. They clearly enjoyed one another’s company. While this isn't a traditional portrait, the boy's mom loved it so much that it's hanging as a large portrait in her home. We love it, too. We actually worked right in the backyard where these boys live. While Boone has fantastic portrait locations, our first choice is always what’s most special to you - whether it’s your home, or your favorite place to hike or picnic. When creating portraits of children and families, we always try to capture images that are spontaneous as well as those thoughtfully composed, more classic portraits. We love the portraits that are full of joy and emotion just as much as the portraits of everyone looking their best, smiling at the camera. You’ll have a variety to choose from when you come to the studio to order your portraits. If your backyard isn’t a great portrait spot, don’t worry! We have lots of suggestions for nearby places that will be just right for you. Maybe you’re visiting Boone for your portrait session. Our community welcomes thousands of visitors to the High Country each year. We’ve operated our full-service studio in Boone for over two decades and are very familiar with the area. There are plenty of options. Boone is in the heart of the High Country, home to Appalachian State University, and is right off the Blue Ridge Parkway. It’s named for the explorer Daniel Boone and has the memorable elevation of 3333’. 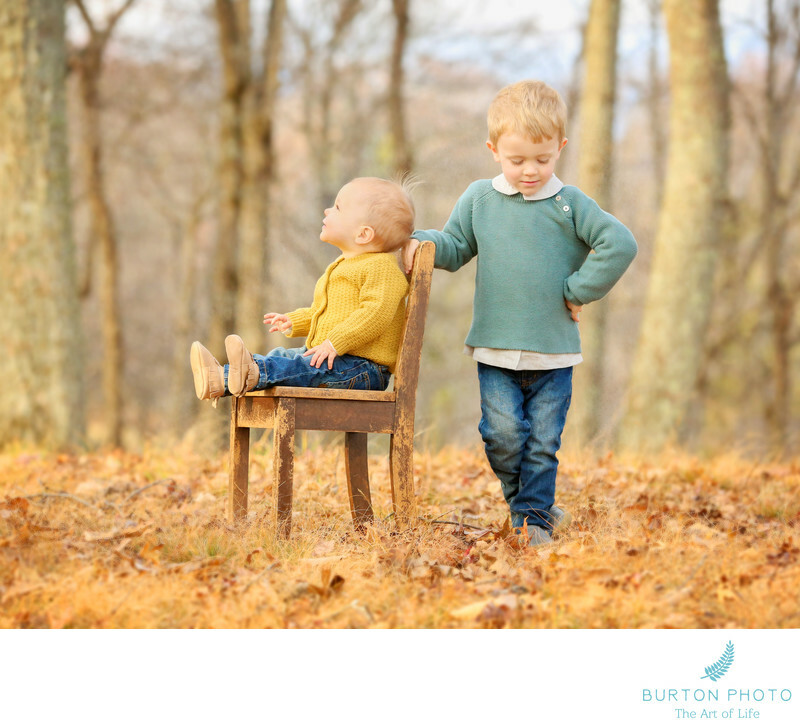 Two of the things we love best about creating portraits in Boone is the mountain scenery and the weather. Long range mountain views, grassy meadows, fields of wildflowers, rocky streams, waterfalls, rustic fences, stone walls, forests, you get the idea! We create most of our portraits on-location for good reason. We are always open to adventure and will carry our gear to wherever you want to go for your session. There are also easier to access locations for those who might have age or mobility restrictions. We’ve created portraits in countless locations and we’ll work with you to find just the right spot for your portrait session. Boone is located in the Northwest corner of North Carolina and is considered a micro-climate with weather patterns most closely related to New England, in sharp contrast to the nearby lowland areas of the rest of the state. Summer and Fall are our favorite seasons with mild temperatures and lower humidity. Winters are long and cold and we get an average of 35 inches of snow. We always keep a list of people hoping for snow portraits. We aren’t afraid of the weather and you don’t need to be, either!